Technology continues to alter how people and goods move. One innovation that has the greatest potential to upend traditional travel is the automation of driving. Automated vehicles (AVs) could completely transform mobility networks, dramatically improve safety, reduce emissions, and provide access and mobility to underserved parts of society. The proliferation of AVs could also lead to more suburban sprawl, congestion, greenhouse gas emissions, and higher costs. Putting the right public policy in place now will help ensure that the transportation system of the future is safer, equitable, and more efficient. In recent years, automated and semi-automated driving technologies have progressed significantly. Some automated features, such as lane centering and adaptive cruise control, are available on cars and trucks on the lot today and more advanced automotive technologies are currently being tested on public roads. Although there is much speculation about when fully automated vehicles will be widely and commercially available, there is no question about the impressive speed of recent development. Meanwhile, the emerging AV industry is asking policymakers to adapt domestic frameworks to address the demands of AV sales and ensure U.S. competitiveness in the global market. This includes updating regulations, funding research and development, and investing in infrastructure. Crafting policy and investment plans that can adapt to a changing environment poses significant challenges for public officials at all levels of government. Nevertheless, it is important to consider the policy implications for AVs now as test vehicles with automated driving systems are already sharing public roads with drivers. Infrastructure updates, such as well-maintained pavements, striping, and signage, can facilitate technological benefits and increased safety. The overarching aim of federal- and state-level policy on AVs should be to ensure public safety, to provide consistent frameworks for developers, and to create an environment where rules can adapt to unknown future outcomes. Given that AVs are still in the development phase, governments must take a performance-based approach instead of imposing strict technical requirements. The federal government has a clear role in regulating the safety of automated driving systems. 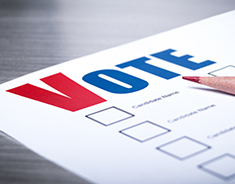 States and local governments have more flexibility in the areas they have traditionally managed, such as roadway design, rules, and licensing, and may choose to pass laws or take executive actions, while others prefer to not take any steps. While each method comes with certain tradeoffs and pitfalls, each government must decide what is right for their own constituents. 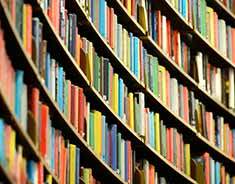 Within a broad framework, the following items outline specific steps or considerations of any approach. The global aviation industry faces growing workforce challenges. Strong competition for workers, the changing nature of high-skill jobs, and a retiring generation all profoundly affect many countries’ modern economies. The problem is especially acute in the United States and the United Kingdom, the largest and third largest aviation markets in the world, respectively. Both countries need to attract new workers to fly and maintain aircraft, manage airports, control air traffic, build and run terminals, and conduct every other job related to advancing a safe, secure, and high-tech aviation industry. Unfortunately, pragmatic policy solutions that comprehensively address workforce challenges across all aviation subsectors are limited. The aviation industry will face a number of workforce pipeline challenges as demand for air travel grows in the coming years. Though the outlook on worker availability varies depending on the specific occupation, the number of jobs in aviation is expected to grow. The degree to which technology will replace jobs is unknown, but technology will change the nature of jobs across the entire aviation workforce. The industry must ensure that new and existing personnel are trained to utilize new technologies. Workforce demographics are shifting, as a wave of current employees prepares to retire and the generations that replace them are more diverse. To fill future jobs, the industry will need to appeal to a broader demographic. Following a number of challenges that resulted in cost cuts between roughly 2001 and 2009, the aviation industry has since begun to increase wages. The industry has used incentives, signing bonuses, and higher salaries to attract and retain workers. The aviation industry is competing with itself, other professions, and other countries to retain workers. “Workforce bleed” to other industries, offshoring to other countries, and recruiting established personnel from other sectors (e.g. airlines hiring military pilots) are all manifestations of this competition. Check out our two-page summary of the report. Cities, states, and metro areas throughout the United States are going through a period of profound change and transition that is having enormous impacts on public transit. Demographic and cultural changes now alter the very function and purpose of our transportation network and whom it is serving. At the same time, disruptive technology is being deployed throughout the built environment that enables greater efficiency, new actors, and more mobility options. And, of course, we are going through a period of profound political and institutional change challenging notions for the role of government in the transportation sector. These forces affect how we travel, how information is shared, how public agencies manage and invest in transit, and how private firms engage. To better understand these effects, Transdev, an international private-sector transport operator, commissioned a survey by Ipsos, a market research consultant, to gauge the challenges transit agencies face as well as their expectations of private sector transport operators. The survey of transit officials began with an open-ended question about their primary concerns over the next three years, followed by specific questions regarding their attitudes towards the deployment of new technology, partnerships, and customer service, among others. This summary was prepared independently by Eno. It does not report on every element of the survey but is organized around several key themes that emerged as a result of an analysis of the results. View the original report on the survey results at Transdev North America. Check out an infographic summary of the report. The “trade war” between the United States and China continues to play out on the global stage. While it does, a seemingly benign but thorny matter about the manufacture of mass transit vehicles and freight railcars has risen to the surface, pitting macro issues about national security and economic competitiveness against cities’ interest in investing in their transportation systems as well as their budgetary bottom lines. Specifically, it appears that the United States Congress will soon approve a policy that restricts spending certain federal funds on transit vehicles from companies owned or subsidized by the government of the People’s Republic of China. The focus of the new policy—at least in part—stems from national security concerns. 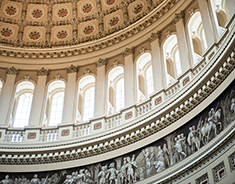 The 2019 appropriations bills contain several references to potential threats posed by Chinese telecommunications and information technology manufacturers. In addition, the new defense authorization law will require the Department of Homeland Security to perform a study of the national security implications of Chinese-manufactured transit given the proliferation of advanced electronics components in new transit vehicles. Related economic concerns around technology transfer and intellectual property are widespread. The target of the vehicle ban is CRRC Corporation Limited, the world’s largest supplier of rail transit equipment with annual revenues of around $30 billion, good enough for 385th on the Fortune Global 500 List. CRRC is almost completely dominant in the enormous Chinese railcar market and has been successful abroad in the last few years, handily winning contracts for new rail transit cars in major American cities like Boston, Chicago, Los Angeles, and Philadelphia. In each case, CRRC beat other foreign-owned manufacturers since there are no American transit railcar manufacturers today. While the relatively low purchase prices clearly benefit transit agencies and governments, proponents of the ban argue that the degree to which CRRC has been able to underbid other manufacturers is due to the heavy subsidies it receives from being a state-owned enterprise (SOE). Competing unfairly in the market this way, ban proponents assert, would allow CRRC to corner the transit railcar market. They then point to domestic freight railcar manufacturers (there are several in the United States) as the next target for CRRC. Of course, being an SOE in a so-called ‘non-market economy’ also sets off alarm bells from may corners of the national security community, especially the perception of growing risks to America’s critical infrastructure. Opponents of the policy change focus on the relief to taxpayers from the low costs of transit vehicle purchases. They also contend the American jobs created from the construction of vehicle assembly plants—as well as the adherence to local policy and priorities to support disadvantaged workers—are important counterbalances to the potential loss of market share for domestic freight car manufacturers. With new vehicle purchases slated in major transit markets like New Jersey and Atlanta, it is important to fully examine the rationale and implications of the ban and contextualize the issue in order to inform the larger national debate. The purpose of this policy brief is to analyze the impetus for the proposed ban on vehicles produced by Chinese SOEs and understand the implications for American cities and manufacturers. It illustrates the recent Congressional action, federal rules such as Buy America, and the broad impacts on American manufacturing jobs. The brief also recognizes and includes the real and valid security worries inherent in the manufacture of modern, connected rail vehicles and the relationship to elevated clashes between the United States and China. Ultimately the goal is to inform the development of a policy framework for lawmakers to consider. Photo: CRRC-supplied subway train undergoing testing on Beijing Subway’s Line 16, September 2016. Courtesy of Wikimedia Commons user N509FZ. Airport infrastructure investments, such as new runways, modern terminals, and improved ground access, are a top priority for governments and the traveling public. Robust revenues from parking, concessions, and landing fees pique the interest of private sector investors looking for long term, stable returns. Airport privatization proposes to bring the two together: governments give airport investment and management responsibilities to a private company that keeps excess returns, and then invests to attract more air service and passengers. While airports are commonly privatized abroad in places like Europe and Australia, only one airport is privatized in the United States. This report reviews the policies that govern airport privatization in the United States, recent history in domestic case studies, and the implications going forward. In the end, circumstances unique to the United States greatly limit the usefulness of privatization in solving airport problems. While privatization may be attractive in some circumstances, policymakers first need to clearly understand the problem they are trying to solve, and whether privatization is the best approach. *New: Click here to download track maintenance data used in this report. Public transit maintenance is not often headline news. Yet with high profile closures and disruptions to rail systems in major metropolitan areas like New York, Baltimore, and Washington, the condition of this infrastructure is very much in the public eye. These systems all need major track maintenance overhauls, but the real overhaul needs to be in how agencies conduct their asset management and maintenance programs. Together, major rail systems in U.S. cities move millions of people every day, and the lack of regular maintenance and upkeep has direct effects on the efficiency of personal mobility and regional economies. While local elected officials and voters time and again approve proposals to raise revenues for new projects, reinvesting in existing systems is too often ignored. But the more maintenance is deferred, the more it will cost to return to a state of good repair in the future, and the less reliable the service will become for riders. This study examines rail maintenance program needs and practices through dozens of interviews with public and private stakeholders and experts around the country. The consensus was that asset management practices in the United States are inadequate to meet today’s maintenance challenges. The first step that agencies need to take in their efforts to run a consistently well-maintained system is to dramatically improve their transit asset management. While the federal government has stepped in to require transit agencies to pay better attention to maintenance, the industry still lags international best practices. True plans and processes based on the actual observed condition of the infrastructure—predictively repairing or replacing them when conditions and timing warrant—is needed. Such an approach requires structural and cultural change, and significantly more initial investment to coordinate data from sensors, monitoring devices, and human observation. Track inspectors and front line workers are the most keenly aware of the long term problems with deferred maintenance, but face legacy work rules and limited budgets to invest in modern asset management systems. Agency leadership and boards prioritize system expansion over the needs to keep the system in a state of good repair. The paper also explores the use of private contractors for some or all of track maintenance, which is often proposed as a solution to maintenance challenges. Older rail systems in the United States rely almost exclusively on in-house staff to conduct basic infrastructure maintenance and upkeep. But when there are extraordinary needs, they will also contract with private firms for that work. New systems are turning to private contractors for even the most basic of needs. Once agencies have a firm grasp on asset management, they can consider alternative approaches to rail maintenance, including whether the agency uses in house staff for a particular project or contracts it out to private companies. Contracting out does not necessarily offer a better approach to rail maintenance but, if done carefully, it may create a different set of incentives and accountability than some agencies rely on today. If considering a contracted approach, an agency must act to minimize negative effects on the existing workforce. When contracting, agencies need to carry out a fair and functional procurement process, write an effective contract, and manage it effectively. There is no single “cure-all” policy or mechanism that will fix all the problems that are resulting in the infrastructure failures and deferred maintenance that plague many U.S. transit systems today. However, agencies must start by creating a culture of maintenance prioritization through effective asset management. The goal must be to go beyond complying with baseline federal rules and put in place state of the art practices in condition-based and life-cycle maintenance. Contracting represents a way for agencies to test alternative methods, but they need to publicly track, test, and benchmark the alternative approaches for transparency and accountability, which in turn also aid in garnering and maintaining public trust. How does the federal government subsidize air service to small communities? Over the past 15 years, changes in the airline industry have consolidated air service at the largest hub airports while passenger levels at medium hubs have remained consistent. But the smallest of airports usually do not have enough demand to maintain commercial air service. So for nearly 40 years, the federal government has been funding air travel to and from small communities across the United States. In 1979, when the federal government deregulated the airline industry, Congress established the Essential Air Service Program (EAS) to subsidize flights to the smallest airports. The busiest of those airports, Joplin, Missouri, has on average fewer than 160 passengers per day. Some EAS airports have fewer than a dozen passengers departing per day. The program was initially intended to last only 10 years, but was extended in perpetuity in 1996. Since then, program costs have risen significantly (Figure 1). Figure 1. Essential Air Service spending in millions of constant 2016 dollars (1979-2016). Source: Office of Aviation Analysis, “Essential Air Service,” U.S. Department of Transportation, 2016. One rationale for the continuation of EAS is that many airports are very far from medium or large hub airports, leaving local residents and businesses without options. Figure 2 shows that EAS airports are scattered across America, but not all are very far from a large or medium hub airport. Figure 2. Distance to nearest large or medium hub for airports in the Essential Air Service program (continental U.S. only). On a per-passenger basis, the level of subsidy varies significantly; from close to zero, to several hundred dollars for each passenger flown (Table 1). On the high end of dollars per passenger, 47 percent of the airports within 210 miles of a medium or large hub provide more than $200 per passenger. The highest per passenger subsidy for these airports during FY2016 was received by the airport in Altoona, Pennsylvania. On average, each of the 3,693 passengers that travelled through that airport during FY2016 cost the U.S. Department of Transportation (U.S. DOT) $642. Table 1. Subsidy per passenger for airports in the Essential Air Service program, (FY2016). Figure 3. FY2016 spending on Essential Air Service airports, grouped by distance to large or medium hubs (for those in the continental U.S.). Note: totals might not add up due to rounding. Limiting the program to communities further than 70 miles from a large or medium hub. Requiring a minimum of 10 daily enplanements. Capping the per-passenger subsidies at $200 for communities less than 210 miles from a medium or large hub (and $1,000 for the others). For existing service, U.S. DOT enforced the $200 maximum per passenger subsidy rule between 1990 and 2006, which led to 39 communities losing service during that period. But in 2006 U.S. DOT stopped enforcing the rule. While in 2014 U.S. DOT announced that they would once more enforce the $200 limit, in FY2016 there were still 26 airports above the threshold. EAS program costs have increased four-fold in real terms in the last 15 years (Figure 1). In fact, U.S. DOT still has criteria for considering adding new communities to EAS, including reliability, connections with other airlines at larger hubs, and community views, but notably none of them include cost. Increase the 70-mile minimum distance to a medium or large hub. Enforce the $200 per-passenger cap for airports within 210 miles of such a hub. Table 2. Potential annual savings for the EAS program. Each of the options for reducing the cost of EAS produce only modest savings. Even in a scenario where EAS is only provided to airports that are a minimum of 150 miles from a medium or large hub, the $200 passenger cap is enforced, and the 10 daily enplanements are enforced, the potential savings would only amount to $114.3 million. Additionally, EAS is a relatively small program when compared to the broader federal aviation spending: less than two percent of $16 billion per year. The Essential Air Service program distributes approximately $270 million per year to support commercial air service to small airports. Unfortunately most Americans will never take advantage of this program, as the busiest EAS airport serves on average only 160 passengers per day. Public subsidies play an important role in guaranteeing air access to many small communities. However, EAS also subsidizes service to communities that have reasonable ground access to medium and large hubs. Rules created to decrease costs associated with the program have not been enforced. The EAS program could be cut back, but it represents only a small portion of overall federal expenditures in aviation. Question 9: Should the federal government invest heavily in expanding American airports to relieve congestion? “How has air travel in specific metropolitan areas changed in recent years?” Eno Center for Transportation, 2017. When the program was created there were 746 eligible communities, including 237 in Alaska and nine in Hawaii, but only around 300 of those communities have ever received any subsidized service. See: Jeff Davis, “Trump Budget Battles the Legacy of Regulated Routes,” Eno Transportation Weekly, April 10, 2017. Researchers have provided several reasons for the dramatic increase in costs. See: Rachel Y. Tang, “Essential Air Service (EAS),” Congressional Research Service, 2015. Since 2006, only one airport (Brooking, South Dakota), has lost service because it exceed the $200 per passenger subsidy limit. U.S. DOT has, however, kept enforcing the $1,000 per passenger maximum subsidy, and three airports lost service due to that cap in 2016. Since 2012 8 airports lost service because of the $1,000 rule. See U.S. Department of Transportation, “Essential Air Service Communities Eliminated Due to Per-Passenger Subsidy Cap (Updated October 2016),” 2016. Office of Aviation Analysis, “Notice of Enforcement Policy, $200 Per Passenger Subsidy Cap,” U.S. Department of Transportation, 2014. Jeff Davis, “White House Releases Full FY18 Budget Request,” Eno Transportation Weekly, May 23, 2017. Should the federal government invest heavily in expanding American airports to relieve congestion? Airport congestion, and ensuing nationwide delays, are disruptive to travelers and to the American economy. The federal government is capable of awarding grants aimed at bolstering our nation’s airports. But is that the best way to improve airports for most travelers? Congestion and delays often start at high demand airports with limited runway capacity and become national problems because they have ripple effects across the country. But runway capacity issues are actually limited to only a few U.S. airports. The three airports in the New York City region, Washington Reagan National Airport, San Francisco International, and Los Angeles International are the only airports that need substantial increases in their runway capacity in the short term. 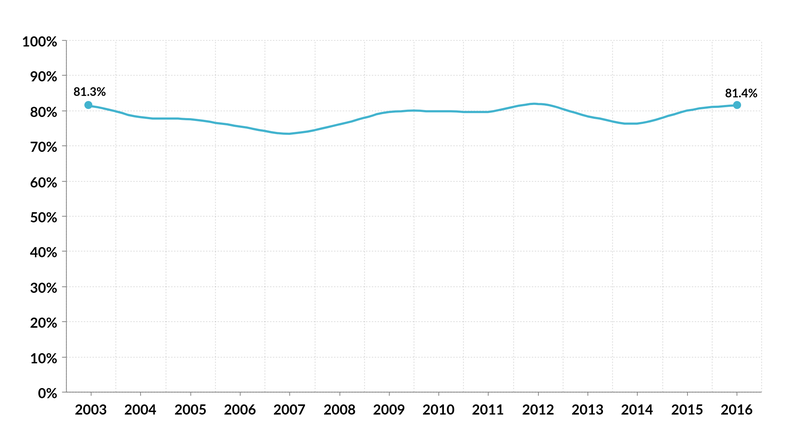 In fact, most airports are seeing fewer flights than 10 years ago, as shown in Figure 1. Of the top 50 busiest airports in the United States, only eight increased their domestic departures in the past decade. While passenger traffic is up at more than half of these airports (not due to airlines flying fewer flights but larger aircraft), the need for new runways, which is the most expensive capital investment an airport can make, is actually decreasing. Figure 1. Total number of scheduled departures at small, medium, and large hubs (2005-2016). Since 2011, airports have reported a 40 percent reduction in capital investment needs. Figure 2 shows the unfunded investments such as regular maintenance, improvements in safety, and capacity expansions continue to decline (terminals and access to the airports are not included in these estimates). Figure 2. 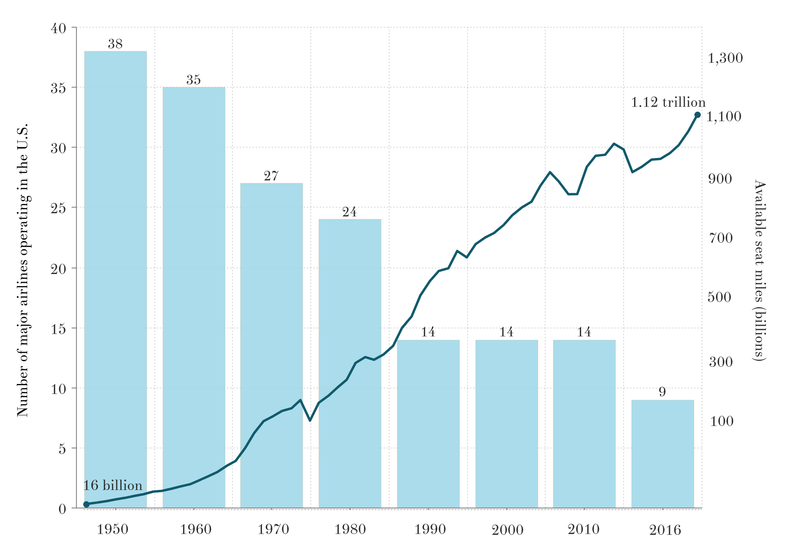 Unmet airport capital investment needs in billions of constant 2016 dollars (1980- 2015). Values in each column represent the purported needs for the following five years. Source: Federal Aviation Administration, “Report to Congress – National Plan of Integrated Airport Systems (NPIAS) – 2015-2019,” U.S. Department of Transportation, 2015. 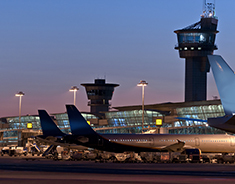 Three main factors explain why unmet airport investment needs are decreasing. First, some airports might have capacity expansions that are beyond their five-year horizon, and therefore are not included in this estimate. Since the budget figures submitted to the FAA only measure capital needs for the next five years, any project expected to start after that period is not captured. Second, the FAA has been working more closely with airports to assess their true needs. Between the 2013 and 2015 reports, airports removed 1,600 out of 19,000 projects that were deemed not feasible. Finally, airports are handling fewer commercial and general aviation planes, meaning less need for capacity expansions. 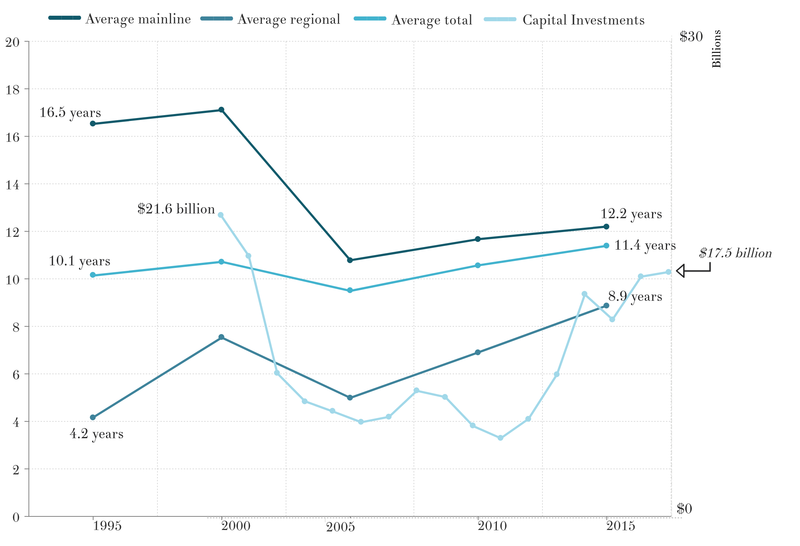 Regardless, $34 billion in unmet investment needs is a daunting number. However, less than half of that is for improvements at the nation’s busiest airports. Table 1 shows that among large, medium, and small airports, where 97 percent of all passengers fly, $15.5 billion in new investment is needed. Table 1. Airport capital investment needs by airport category (2015-2019). To cover their capital expansion and operating costs, airports are currently funded through a multitude of mechanisms. 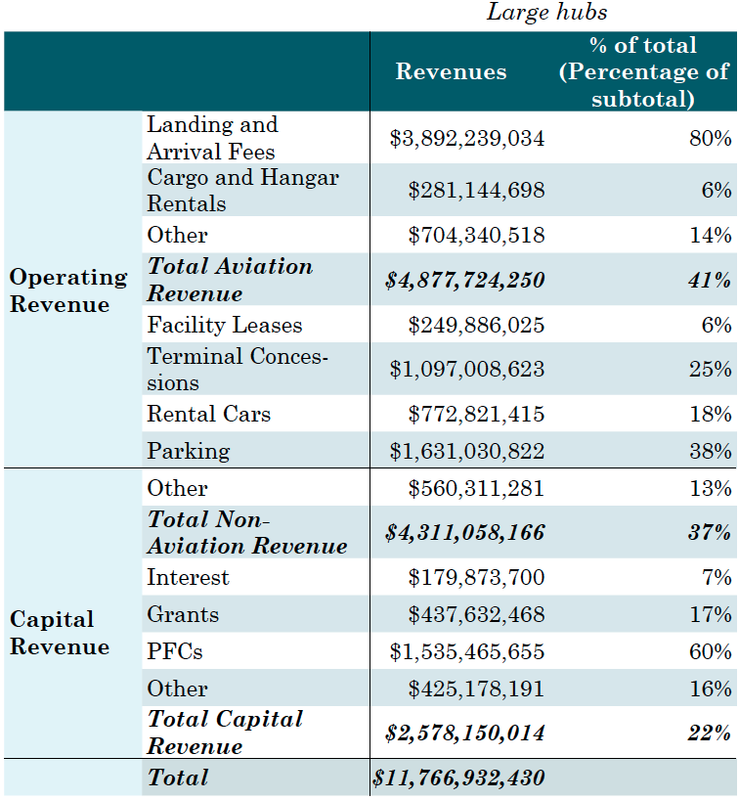 Table 2 shows how large, medium, and small hub airports raise revenues, including landing fees, concessions, and parking fees. Capital construction on airports comes from revenue sources that include bonds issued by airport authorities, the Passenger Facility Charge (PFC), investment by the airlines, or federal grants via the Airport Improvement Program (AIP). Table 2. 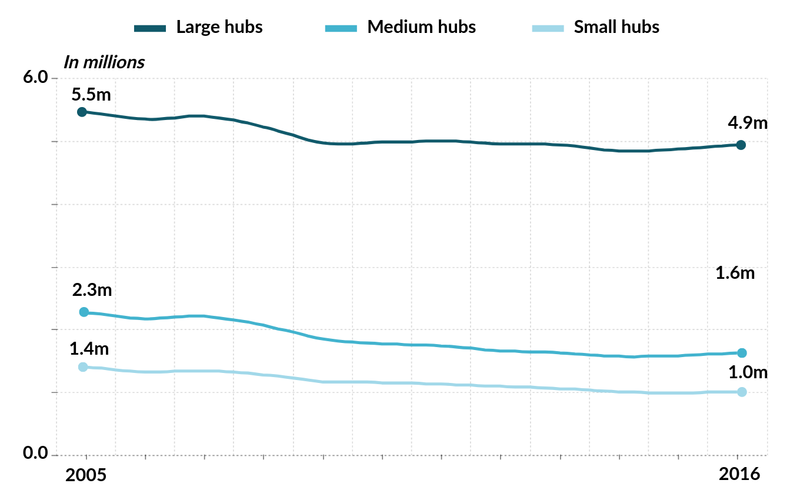 Sources of revenue for small, medium, and large hubs (2016). Source: Federal Aviation Administration, “(CATS) Certification Activity Tracking System,” U.S. Department of Transportation, 2017. While the proportion of revenues for operating expenses is relatively consistent among airports, the source of revenue for capital improvements shifts as airports get smaller. Small airports are heavily dependent on federal grants through the AIP program, and larger airports mostly use revenues from PFCs for their capital needs. Under the current PFC program, the federal government allows airports to charge passengers a fixed fee up to a cap of $4.50 for capital improvements on the airport. The AIP is a federal grant program funded through the Airport and Airway Trust Fund (AATF) and managed by the FAA. It distributes money to eligible projects in all public airports and select private airports. Eligible projects include enhancing airport safety, capacity, security, and environmental concerns. Depending on the size of the airport, grants from the AIP program can cover up to 95 percent of the cost of a project. In fiscal year 2016, the AIP funded more than 1,750 projects, with costs ranging from $15,000 to $36 million per project. Of the $3.3 billion that AIP distributes each year, primary airports, which carry more than 99 percent of U.S. passengers each year, receive around two-thirds of AIP funds. 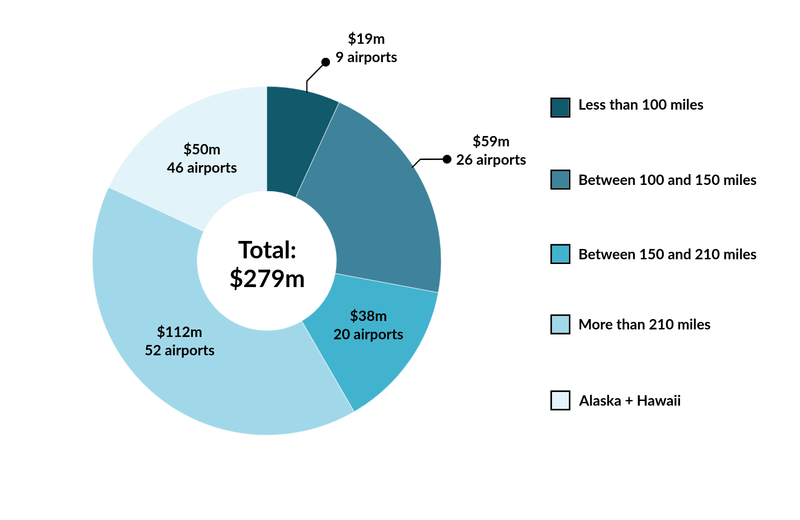 These airports have purported needs of $20.5 billion for the next five years. Very small non-primary airports, each with a maximum of 10,000 annual passengers, receive the remaining third. Their capital needs for the next five years are $12.6 billion. • Airlines are moving a record number of passengers, but are using fewer flights than a decade ago. Unmet capital needs are 40 percent lower than in 2011, in part due to declining number of flights. Only a few airports, namely San Francisco, Los Angeles, Washington Reagan, and those in New York, could justify new runways in the short term. • Current capital needs at large and medium hub airports, which carry 88 percent of all domestic traffic, are relatively low on a per passenger basis. $3.04 per passenger for five years would cover all unmet capital needs at those airports for the next five years. • Federal grants through the AIP program will not adequately address the capacity needs of most fliers. 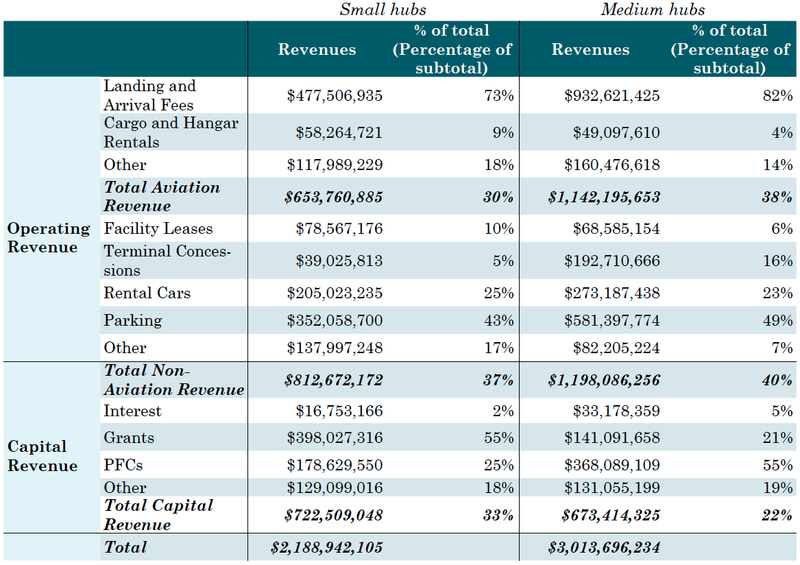 This revenue source is vitally important to small airports, but not significant to the largest. • New funding from the federal government to address capacity needs cannot be a one size fits all solution. Making a real difference in capacity means investing billions in just a few major airports. And new federal funding might not be enough: expanding runways can mean removing nearby homes and businesses, or affecting sensitive wildlife areas. Question 8: How do taxes and fees change if air traffic control is privatized? Ally Marotti, “Trump Tells United CEO, Other Airline Execs He Wants to Rebuild U.S. Airports,” Chicago Tribune, February 9, 2017. Eno Center for Transportation, “Addressing Future Capacity Needs in the U.S. Aviation System,” November 2013. For a full explanation see: “How has air travel in specific metropolitan areas changed in recent years,” Eno Center for Transportation, December 2017. 79 percent of the capital needs in the latest (2015) report relate to maintaining current infrastructure, with the remaining being used for capacity expansions. Federal Aviation Administration, “Report to Congress – National Plan of Integrated Airport Systems (NPIAS), 2015-2019,” U.S. Department of Transportation, 2015. A report by Airports Council International – North America, a trade group for airports, estimates that the capital needs for U.S. airports total $99.9 billion for the 2017-2021 period, an increase of 32 percent since the last estimate made in 2015. This estimate includes all airport projects, not only on the airside like the FAA’s report, and includes both ongoing and proposed projects, with each representing around 50 percent of the purported needs. See: Airports Council International – North America, “Airport Infrastructure Needs – 2017-2021,” 2017. The actual dollar amount of these 1,600 projects was not reported. See: Federal Aviation Administration, “Report to Congress – National Plan of Integrated Airport Systems (NPIAS), 2015-2019,” U.S. Department of Transportation, 2015. While traffic in the 1990s kept growing at a fast pace, airports saw the need for major investments in the near future. However, the events of September 11, 2011, combined with a struggling economy, financial problems at the airlines, and raising fuel prices, led to declines in traffic for all types of airspace users. The forecasts for the next two decades, while predicting some growth, expect that traffic for both commercial airlines and general aviation users, to be at or below the levels seen in 2001, thus reducing the need for expansions. See: Federal Aviation Administration, “FAA Aerospace Forecast – Fiscal Years 2016- 2036,” U.S. Department of Transportation, 2016. As defined by the FAA. See: Federal Aviation Administration, “Airport Categories,” U.S. Department of Transportation, 2016. Estimates cannot be made for general aviation and reliever airports, since those airports do not carry passengers commercially. Initially established in 1990 with a cap of $3.00 per passenger, the PFC maximum cap was increased to $4.50 in 2001 and has remained the limit since. Federal Aviation Administration, “Airport Improvement Program (AIP),” U.S. Department of Transportation, 2017. How do taxes and fees change if air traffic control is privatized? 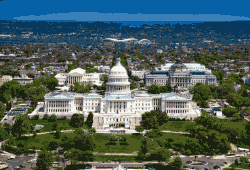 Congress and the Trump administration have proposed to overhaul air traffic control (ATC) in the United States by removing the ATC function from the federal government and assigning it to a non-profit private corporation. Research demonstrates that this model would result in a more efficient, modern system. A major aspect of the proposed reform is overhauling the current tax-based funding structure to one that is based on user fees. Currently, each passenger pays a tax based on the cost of the ticket (7.5 percent of the ticket cost), plus a $4.10 segment fee for each flight on a trip. Airlines also pay $0.043 per gallon of jet fuel they use. One of the issues raised during the debate on ATC reform is whether user fees would lead to more expensive flights for passengers. To determine how flyers would be affected by ATC reform, Eno compared the current approach to ATC to one used in Canada. NAV CANADA, the Canadian ATC organization, is run by a non-profit entity (similar to proposals for a reformed U.S. model) and funds itself by charging fees to the airspace users based on aircraft weight and distance. Eno selected twenty routes (Figure 4) at random, with an emphasis on large and medium hub airports since those carry over 85 percent of all domestic passengers. Eno estimated the distances flown on each route, and the average fares using U.S. Department of Transportation (U.S. DOT) data from 2016, also shown in Table 1. Source: Office of Aviation Analysis, “Domestic Airline Consumer Airfare Report,” U.S. Department of Transportation, 2017 and Great Circle Mapper (www.gcmap.com). To estimate the taxes paid per route, the assumptions were made based on fuel consumption and passenger load (Table 2). *MTOW=Maximum Take-Off Weight. Sources: Aircraft specifications from Bombardier, Embraer, Airbus, Boeing. Not every aircraft flies at maximum passenger capacity, thus the average load factor for domestic flights in 2016, 84.6 percent, was used to calculate the number of passengers on each flight. Additionally, not all taxes collected go to fund ATC operations: roughly one-third go to airport development, safety regulation, and other FAA functions. As such, Eno estimated the “cost of ATC” for each flight to be two-thirds of the taxes collected. Canada employs direct user fees, instead of taxes, to fund ATC. NAV CANADA fees are based on the distance travelled and the weight of the aircraft. The current fee structure includes a terminal charge and an “en-route” charge that take into account the aircraft weight and the distance flown. An exchange rate of 1 CAD = 0.75 USD was applied for comparison. 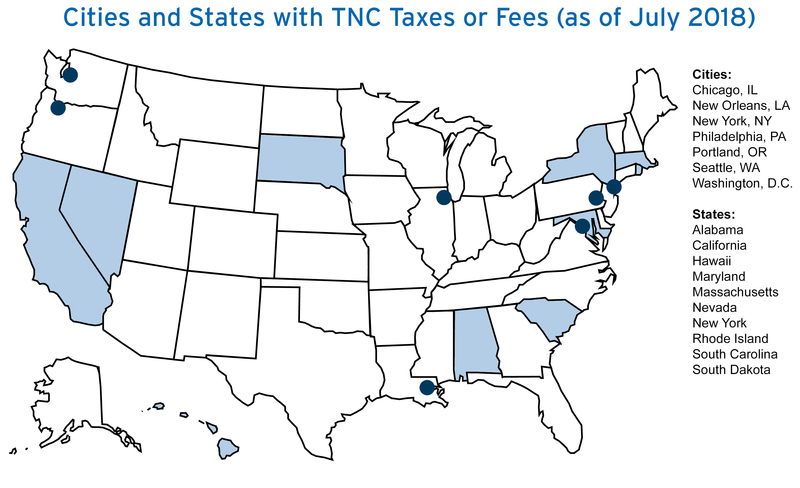 Table 3 shows the current U.S. taxes collected for each flight and the estimated costs if the NAV CANADA fees were applied on the same routes. The last column shows the calculated percent difference from the American system to the Canadian system. The comparison is not intended to indicate that a reformed U.S. system would immediately apply the current NAV CANADA rates. Instead it demonstrates how different types of aircraft flying to different airports might be affected relative to one another. *Regional jets (CRJ200 and E190) do not fly routes further than 1000 miles. Source: Eno Center for Transportation estimates. 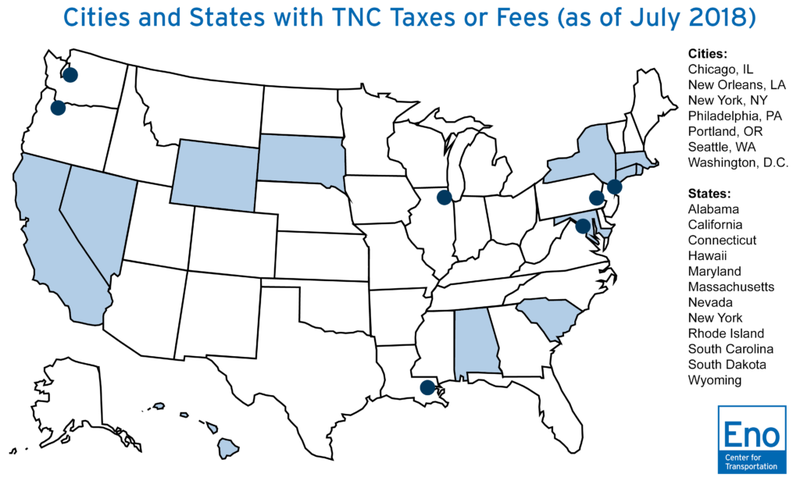 The analysis shows that the NAV CANADA ATC fees are consistently less expensive than comparable taxes charged to passengers and airlines in the United States. The lowest calculated difference show NAV CANADA fees are 30 percent cheaper than U.S. taxes (Oakland-Denver flight on a CRJ200). The biggest difference comes from a Dallas Love to Birmingham flight on a 737-800 that would be 61 percent cheaper on the Canadian system. Overall, the results indicate that flights flown with large, mainline aircraft saw the biggest reductions when applying NAV CANADA’s rates. This is due to the manner in which larger aircraft with more passengers collect more taxes, and the increased emphasis given to the distance flown in the case of Canada. While user fees increase proportionally to increases in distance, they increase less for increases in weight of the aircraft (Table 4). Source: Eno Center for Transportation estimates. Cargo aircraft moved over 13 billion tons of packages, food, and other goods domestically in 2016.11 Instead of ticket taxes, air cargo is assessed at a 6.25 percent waybill fee on the cost of transportation, which goes to support ATC services. Cargo airlines worry that the new fee structure could impose greater costs on them, with little benefit. While this is an important consideration, this analysis does not consider how cargo aircraft would be affected in a weight and distance fee system. • NAV CANADA’s air traffic control fees are significantly lower than the current tax structure used to fund the United States’ system. This suggests that the Canadian model is more cost effective. Since it’s inception in 1996, NAV CANADA has reduced fees by over 30 percent, not counting inflation. • Eno’s analysis shows that larger aircraft would see the most savings from a weight-distance fee structure. •The fee structure does not take into account airport size, so smaller airports are not negatively affected with respect to larger hubs. However, flights to and from medium hub airports tend to use smaller aircraft due to the lower levels of demand, and therefore could have higher fees than destinations that attract larger aircraft. Question 7: What do we know about aircraft delays? 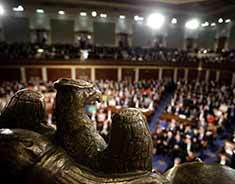 U.S. House of Representatives, “H.R. 2997 – 21st Century Aviation Innovation, Reform, and Reauthorization Act,” 115th Congress, 2017. Neiva and Puentes, “Time for Reform: Delivering Modern Air Traffic Control,” Eno Center for Transportation, 2017. The Canadian system reduced fees 30 percent from when they were first enacted in 1999, while also deploying new technologies quickly and involving stakeholders in governing the system. See: Neiva and Puentes, 2017; and Air Traffic Management, “Nav Canada 2017 Fees to Save Airlines $100m,” Air Traffic Management, July 18, 2016. First, 10 medium and 10 large hubs were selected at random among their respective cohorts. Then for each of these airports a nonstop route flown from these airports during 2017 was also selected at random. Eno Center for Transportation, “Jet Fuel Prices Have Dropped Significantly. Why Haven’t Ticket Prices?” Eno Aviation Insights No. 2, 2017. For more detail and exact calculations, see: NAV CANADA, “Customer Guide to Charges—Effective September 1, 2017,” 2017. Other reports have reached similar conclusions on the cost advantages of the Canadian system compared to the United States. For example, the Civil Air Navigation Services Organisation, a trade organization for ATC providers, concluded that the hourly costs of providing ATC in the Canada were 26 percent cheaper than in the United States. See: Civil Air Navigation Services Organisation, “Global ANS Performance Report 2016 – The ANSP View,” 2016. The actual flight is operated by Southwest on a Boeing 737-800 with 175 seats, which would mean that the flight would pay three times as much in taxes. The actual flight is operated by Southwest in either a Boeing 737-300 or Boeing 737-700 with 143 seats, which would mean that in reality the flight would pay slightly less in taxes. Bureau of Transportation Statistics, Air Cargo Summary Data, 2016. In the United States, public transportation agencies are experimenting with on-demand, shared, and dynamic models to augment traditional fixed-route bus and train services. These services—referred to as microtransit— are enabled by technology similar to the mobile smartphone applications pioneered by privately operated transportation network companies. 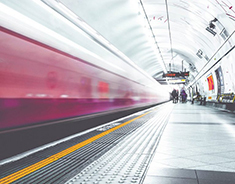 As interest in this technology grows, it is critical for public transportation agencies and departments of transportation to understand the benefits and challenges of incorporating components of these innovations into publicly funded services. The experiences of several public transportation providers reveal important lessons to be applied to the future public operation of flexible route, on-demand microtransit. First, agencies seeking to test microtransit or dynamic, on-demand options need to prioritize customers’ needs ahead of the novelty of new technology and think critically about how to design, develop, and implement a pilot that puts the customer first. Second, agencies should utilize a contracting mechanism that empowers those most familiar with the pilot to make quick decisions outside of the standard processes, in order to be able to fail fast and iterate quickly. Third, the success or failure of the application should be determined based on performance metrics that go beyond ridership changes and farebox recovery, such as improved mobility, increased safety, and enhanced customer experience. Fourth, agencies should establish their goals up-front and work with potential technology vendors to design a microtransit project within those parameters. Finally, agencies should invest in robust marketing and outreach in order to ensure that all current and potential customers understand how to use the service. There is an opportunity for traditional public transit agencies to leverage the potential of flexible route, on-demand microtransit. However, it is critical to keep in mind that technology cannot solve all of public transportation’s challenges. Regardless of the technology available, the customer should remain in the forefront when considering service adjustments and new service models. Agencies should be intentional and deliberate in identifying the problem they are looking to solve or the question they seek to answer when testing microtransit. Microtransit can be operated on a fixed or flexible route, and by a preset schedule or on-demand schedule. There are several potential configurations as illustrated below. This paper focuses exclusively on flexible route/on demand schedule microtransit, the bottom right quadrant. change over the span of a few days. Users request shared vehicles through a tech-enabled application, and the vehicle will deviate from its route to somewhere within walking distance of the requester. Routes can be fully dynamic and adjusted in real time based on traffic and demand or can change over the span of a few days. This is a PDF copy of the report that the Federal Railroad Administration was required to submit to Congress by section 11406 of the FAST Act. It evaluates every railroad’s compliance with FRA safety advisories relating to overspeed through curves and also gives a good summary of the FRA response to the fatal 2013 Metro North and Amtrak Philadelphia derailments. The report was submitted to Congress in May 2016 and does not cover any new service that began after that date. The rise of automated vehicle technology brings with it the potential to offer increased independence to people with disabilities by reducing barriers to transportation. Eno, Securing America’s Future Energy (SAFE), and the National Federation of the Blind (NFB) discussed the potential of this technology, active legislation before Congress, as well as next steps. Where are airline passengers getting the best service? In the United States, airlines are often perceived by the public and portrayed in the media as not being customer-oriented and as focusing more on profits than on the experience of their passengers. Along with anecdotal horror stories, passengers complain of high prices, nickel-and-diming, and limited options. Yet, in reality, the vast majority of fliers take their trips without incident, arrive on time to their destinations, and do so at relatively affordable fares. Consumer advocacy research supports the notion that what really matters to passengers is whether they can find affordable flights to where they want to go, and that they have some options on when to get there. Surveys, like the one conducted by the American Customer Satisfaction Index (ASCI) starting in 1994, give a measurable view of customer perception, as shown in Figure 1. In 2016, airlines ranked higher than some entire sectors such as “telecommunications” (ASCI index of 70.1 in 2016) and “government” (70.3), but still below the top-performing industries of “manufacturing” (82.1) and “e-commerce” (82.4). Source: American Customer Satisfaction Index, “Airlines” and “Benchmarks by Sector,” 2017. Each variable was normalized on a 0-100 scale, with 100 as the best, with a total score calculated for each metropolitan area using a 25 percent weight for each variable (Table 1). Some regions—like New York and Chicago—have multiple airports, meaning business and leisure fliers have those combined options when they are selecting when and where to fly. 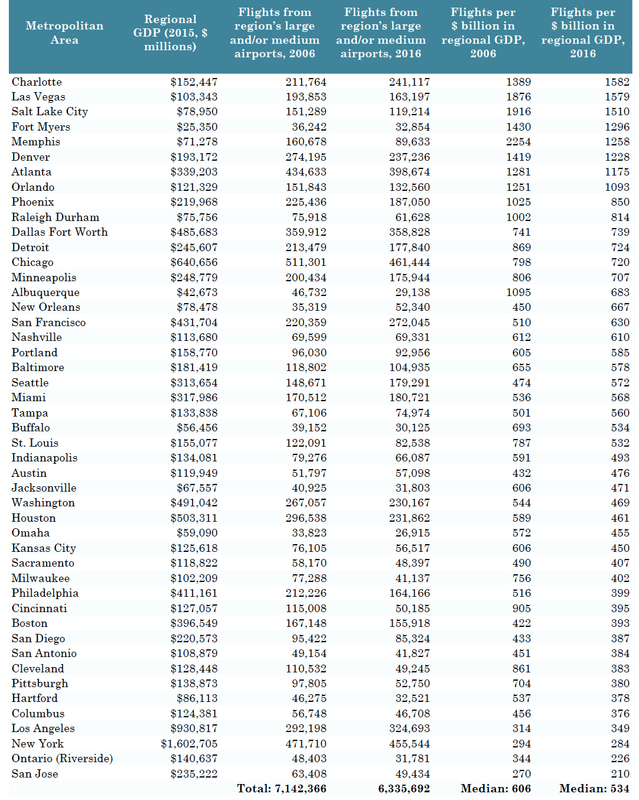 As the table shows, metropolitan areas with more than one airport tend to have the highest scores. Eno’s FlyScore includes frequencies, destinations, prices, and competition, but it omits some measures such as delays, the quality of airport facilities, the in-flight experience, and ground access. While these are important to consider, they either lack consistent data or they are subjective in nature and difficult to incorporate in a metric. Eno weighted the four factors evenly, as there is no scientific research that definitively places one factor of more importance over another. 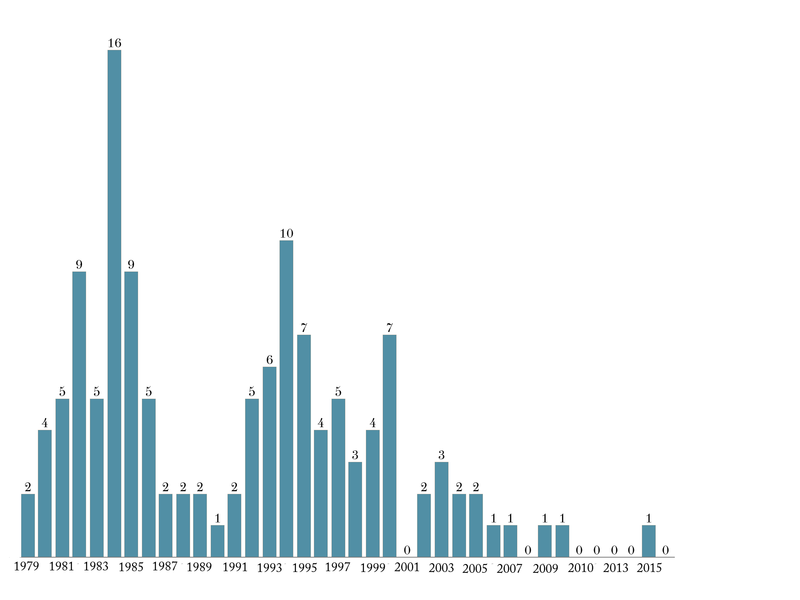 And this FlyScore analysis does not include a comparison over time, in large part because historical numbers of direct destinations is not openly available. Chicago tops the list with a fly score of 94, significantly higher than the second, Denver, at 79. Chicago benefits from each of the factors. Chicago has the most direct domestic destinations in the country, with 170. While Atlanta’s airport has more flights than Chicago-O’Hare, Chicago Midway brings the total for the region higher than anywhere else. Chicago’s airports are also major hubs for United, American, and Southwest, meaning that no airline has more than 32 percent of the region’s market. Finally, Midway has the lowest average fare of any airport in the country. Using these metrics, Chicago is unbeatable. But why do regions like New York, Los Angeles, or Miami not score better when they have multiple large airports serving them? The airports in these three regions have plenty of departures and high levels of competition, but they have significantly fewer direct destinations. Where Chicagoans can reach 170 domestic destinations on a direct flight, Los Angeles, New York, and Miami can reach only 100, 69, and 58, respectively. This is primarily a function of geography. Chicago is located centrally, and there are ample places that make sense to serve from that hub. The other three regions are coastal, making greater domestic destinations less feasible. Also, coastal cities are better positioned to serve international destinations, which are not counted in the FlyScore. Source: Eno Center for Transportation estimates and Bureau of Economic Analysis, “Regional Economic Accounts,” U.S. Department of Commerce, 2017. Comparing Eno’s FlyScore among regions is not always a fair. With metrics such as destinations and frequencies, larger markets, like Chicago, will inevitably get more service than a smaller region, such as Omaha. A comparison of the FlyScore with the regional GDP (Figure 2) yields a better analysis and shows how a region’s economy relates to the number of destinations, flights, prices, and competition in a region. As expected, the FlyScore is generally tied to underlying demand levels of each region, and the FlyScores increase with regional GDP. But some regions deviate from the trend: Las Vegas and Denver have much higher FlyScores with respect to the size of their regional economy, and Los Angeles and New York are much lower, in part for reasons described above. When it comes to regions served by medium hub airports, Raleigh/Durham and Fort Myers stand out with relatively high FlyScores compared to regional GDP. The FlyScore for Raleigh/Durham is due to a combination of higher scheduled departures and lower average fares than many other medium hubs. But the main reason these two cities scored well is that they do not have a dominant airline. The largest share of passengers by any airline in Raleigh/Durham and Fort Myers is 22 percent at both airports. On the other hand, Riverside/Ontario and San Jose are strong economically, yet have FlyScores of 37 and 45, respectively. While fares at those airports fall in the bottom third, they serve few destinations and both have more than 50 percent of flyers on one airline. Luckily for those regions, they are within a reasonable drive of large hubs with high FlyScores. • Although national consumer indices for airlines show steady growth in customer satisfaction since 1994, airline passengers receive different levels of service among metropolitan areas. Eno’s FlyScore gives an indication as to where passengers can access other parts of the country easily, inexpensively, and with choice. • Eno’s FlyScore demonstrates that consumers receive the best service in the metropolitan areas with the greatest demand, measured by regional GDP. Among large hubs, Chicago, Las Vegas, and Denver stand out, as do Raleigh/Durham and Fort Myers among medium hubs as they score particularly high with respect to the size of their regional economies. Metropolitan areas with multiple airports also score well. • Riverside/Ontario and San Jose, located next to Los Angeles and San Francisco, respectively, scored low when factoring in the size of their regional economies. Question 5: How has air travel in specific metropolitan areas changed in recent years? See e.g.,: Blake Fleetwood, “Why Americans Hate Their Airlines,” Huffington Post, April 13, 2017. Eno Center for Transportation, “Is Air Travel Becoming Pricier for Travelers?” Eno Aviation Insights, October 2017. Besides the ASCI metric, there are other indexes published by a number of entities that try to capture consumers’ experiences with airlines. For example, JD Power publishes an annual “airline customer satisfaction” metric. The latest report shows a three-percentage point increase from 2016 to 2017, with customer satisfaction continuously improving since 2013. See: J.D. Power Ratings, “Despite Inflammatory Incidents, Airline Customer Satisfaction Keeps Improving, J.D. Power Finds,” May 10, 2017. Another index is the one published by Embry-Riddle Aeronautical University and Wichita State University, the Airline Quality Rating (AQR). This index uses U.S. DOT data on denied boardings, mishandled baggage, and customer complaints, with different weights given to the different variables. Using this metric, the airline industry as a whole has improved its performance over the past 20 years. The AQR in 2016 was 39 percent higher than the AQR in 1997. This is a trend that the majority of airlines have been following. See: Brent D. Bowen and Dean E. Headley, “Airline Quality Rating,” Embry-Riddle Aeronautical University and Wichita State University, 2017. American Customer Satisfaction Index, “National, Sector, and Industry Results,” 2017. Bureau of Transportation Statistics, “Airport Snapshot,” U.S. Department of Transportation, 2017. Office of Aviation Analysis, “Domestic Airline Consumer Airfare Report,” U.S. Department of Transportation, 2017. How has air travel in specific metropolitan areas changed in recent years? Throughout the United States, the average passenger is paying less to fly and is taking more direct flights than 15 years ago. These broad trends are certainly positive for flyers as a whole. However passengers in specific regions often have a much different experience. While traffic is up and fares are down in large metropolitan areas where service is now concentrated, the experience in other places varies quite a bit. Some regions that were once key centers for major airlines have recently been “de-hubbed,” leading to significant cutbacks. Memphis and Cincinnati, former hubs of Northwest Airlines, saw daily flights fall from 240 to 100 and 600 to less than 100, respectively. Cleveland saw United remove nearly 50 non-stop destinations after its merger with Continental. Yet not all medium hub airports have lost out. Some have seen other carriers come in and partially take over the services they once had. 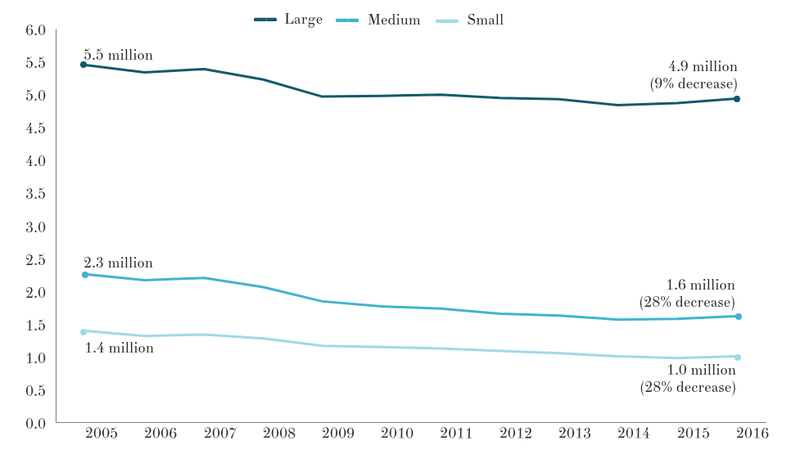 Figure 1 shows that while passenger totals at large hub airports have increased over the past decade, on average, passenger counts at small and medium size hubs have remained relatively the same. A hub airport is associated with an airline that established an operational focus there, such as Delta in Atlanta or American in Dallas. From a statistical standpoint, the Federal Aviation Administration (FAA) defines a hub as any airport that carries more than 0.05 percent of all passengers in a given year. Small hubs carry between 0.05 and 0.25 percent of passengers (less than around five million passengers per year), medium hubs carry between 0.25 and 1 percent (around between five million and 15 million passengers per year), and large hubs more than 1 percent of all passengers (around 15 million or more passengers per year). However, a few airports contribute disproportionally to the decline or growth of the number of passengers carried. 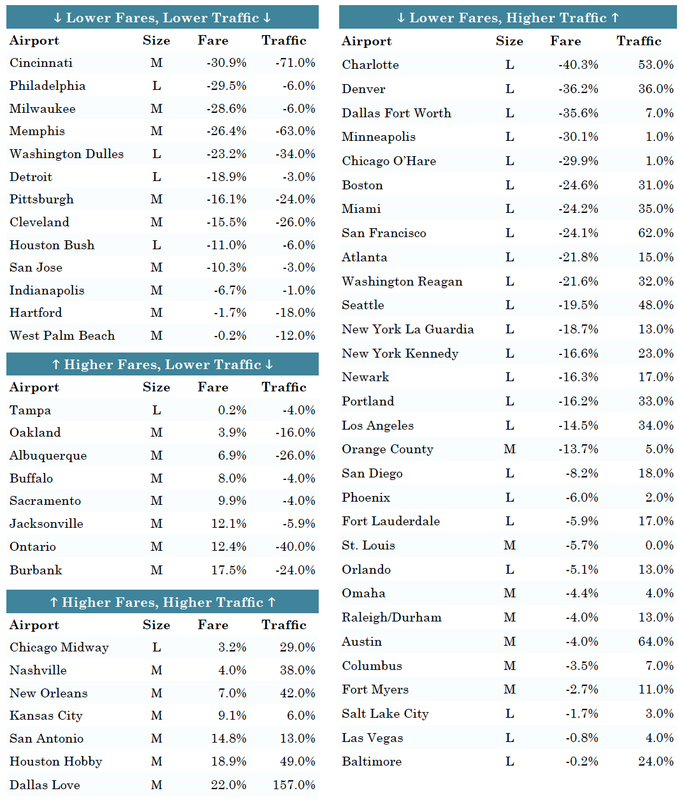 Table 1 shows the airports that have the greatest increase or decline in traffic since 2005. Removing Ontario, Memphis and Cincinnati from the mix, medium hubs would have seen a growth of six percent (14 million passengers) over this period, buoyed from Southwest hubs in fast-growing Texas. The decline in passengers at Ontario, Memphis, and Cincinnati is due to specific aspects of these three geographic markets, explored below. Source: Bureau of Transportation Statistics, “Airport Snapshot”, U.S. Department of Transportation, 2017. As an earlier Eno Aviation Insights brief shows, the cost of an average airline ticket is near all-time lows. 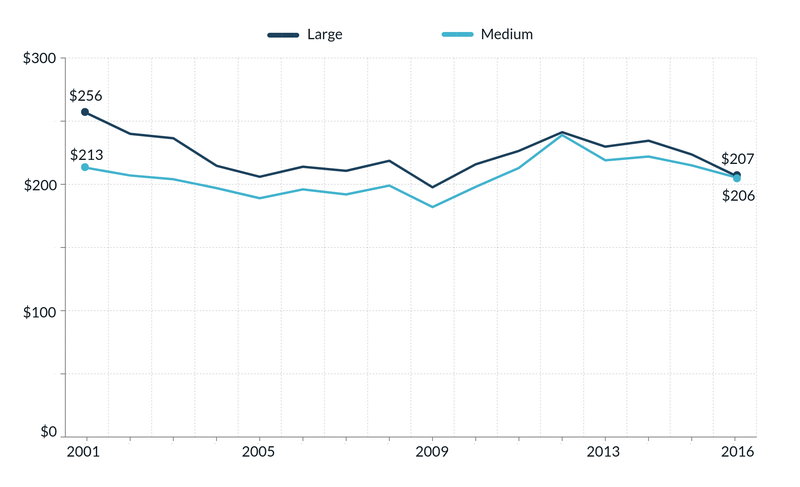 And medium hubs have long been on average less expensive for fliers than domestic flights at larger hubs. However, Figure 2 shows that the gap between ticket prices at large and medium hubs has narrowed. Passengers at the largest hubs, which carry 71 percent of travellers, saw a 3 percent drop in ticket price since 2005 (after the five major airline mergers). But fares at medium hubs rose by 5 percent over this same period. Source: Office of Aviation Analysis, “Domestic Airline Consumer Airfare Report”, U.S. Department of Transportation, 2017. Figures in constant dollars. Table 2 shows the changes in fares and passenger traffic for all medium and large hubs. Almost all of the large hubs have seen both lower fares and higher traffic since 2001. Medium hubs mostly saw declines in traffic and/or increases in ticket prices. Seven airports saw increases in ticket prices above 10 percent over fifteen years (Burbank, Dallas Love Field, Houston Hobby, Jacksonville, Ontario, Sacramento, and San Antonio). Another six airports saw both increases in ticket prices and decreases in domestic traffic: Albuquerque, Buffalo, Burbank, Jacksonville, Oakland, and Ontario. Source: Office of Aviation Analysis, “Domestic Airline Consumer Airfare Report”, U.S. Department of Transportation, 2017 and Bureau of Transportation Statistics, “Airport Snapshot”, U.S. Department of Transportation, 2017. Competition between airlines at an airport can enable more destination and price options as well as better customer service, and airline consolidation could potentially increase the shares of dominant carriers. 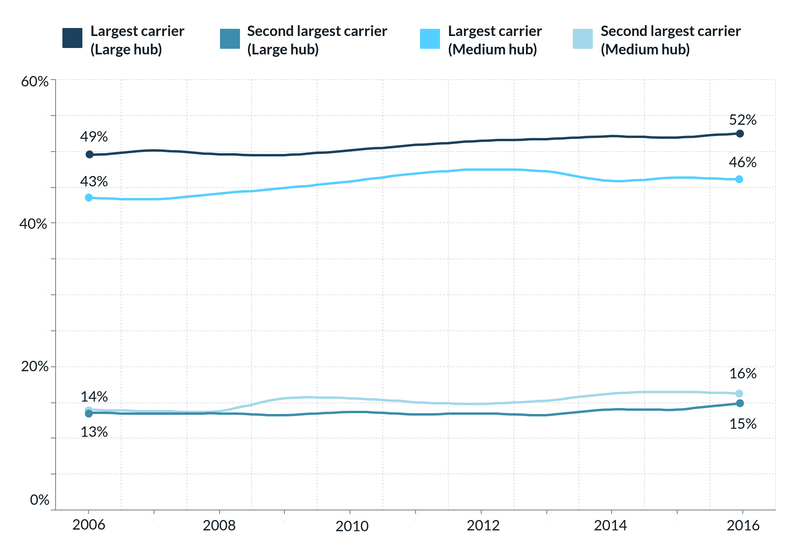 But Figure 4 shows that despite mergers, the average share of traffic by the top two airlines at each medium and large hub grew only slightly over the past ten years (in terms of domestic passengers carried). Looking at specific locations, Figures 5 and 6 show more nuances in individual airports with respect to the share of passenger traffic of the largest airlines. The six airports with the greatest domestic traffic growth in the 2006-2016 period (Figure 5) fall into one of two categories. In the case of Dallas Love and Houston Hobby, the growth is entirely from the dominant airline (Southwest in both cases). For Austin, San Francisco, Seattle, and Charlotte, all had several airlines with a significant presence and all of the airlines have expanded their presence. The six airports with the greatest domestic traffic decline in the 2006-2016 period (Figure 6) fall into one of three categories. The first includes places like Memphis, Cincinnati, and Cleveland that lost their hub status as airlines merged and passenger levels shrank. The second refers to airports that saw significant competition from other nearby airports. For instance, Washington Reagan and Los Angeles both grew substantially, taking traffic from Washington Dulles and Ontario, respectively. Only one airport is in the third category–Albuquerque–where passenger volumes decreased in large part due to the repeal of the Wright Amendment. That obscure federal law had prohibited flights to and from Dallas Love Airport beyond Texas and its neighboring states. Therefore, Southwest had been using Albuquerque as a stopover between Dallas and popular west coast destinations. Once the law was repealed in 2014, the airlines cut flights. Where medium hubs have grown, data shows that it is often from an increase in Southwest traffic. The company’s business model often targets medium-sized airports, which has helped it to become the largest carrier at Buffalo, Burbank, Columbus, Fort Myers, Indianapolis, Kansas City, New Orleans, Oakland, Omaha, Ontario, Pittsburgh, Saint Louis, San Jose, and Orange County. Southwest is now the largest carrier in all but nine of the 32 medium hubs (Table 3). Three of the medium hubs where Southwest is not the largest carrier are not in the continental United States (Anchorage, Kahului, and San Juan). Another factor that indicates the level of service is the frequency of flights in and out of metropolitan areas. Table 4 groups large and medium airports by metro area, and uses number of flights as a proxy for level of service. More flights indicate more destinations and more frequent, competitive service. The table calculates the number of flights relative to the metro area’s gross domestic product (GDP), demonstrating the size of the regional economy and the service that attracts. 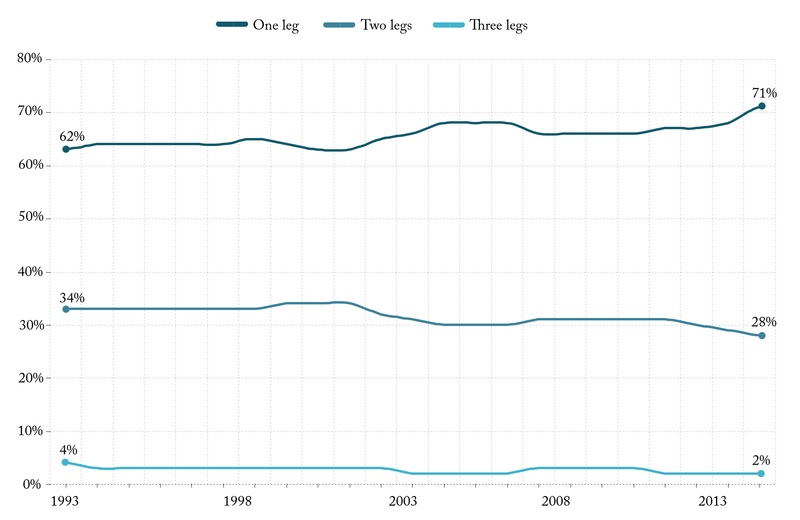 To accommodate the growth in passengers, airlines have handled more passengers on fewer aircraft. In fact, between 2006 and 2016, the 47 largest metro areas (all those served by medium and large hub airports) saw a decline of 11.3 percent in departing flights. Only seven (Austin, Charlotte, Miami, New Orleans, San Francisco, Seattle, and Tampa) saw an increase in total flights. Major hubs for major airlines. Regions like Charlotte, Denver, Atlanta, Phoenix, Chicago, and San Francisco have significantly more flights per regional GDP than the national median. In each of these cases, the airport is a major hub for one or more of the largest airlines in the United States. In these cases, many of the passengers at the airports are connecting to other flights. Major tourist destinations. Tourism accounts for nearly 50 percent of all flyers in the United States.13 Many of the airports that have more flights per regional GDP than the national median include popular destinations such as Las Vegas, Fort Myers, Orlando, and Nashville. These places would have higher flights per GDP regardless of consolidation due to their demand, shown by the diversity of airlines that serve them. Large international gateways. Several large regions, such as Los Angeles, New York, Houston, and Washington, have fewer flights per regional GDP than the national average. This is in large part because the data only shows domestic flights, and each of these are major international gateway airports. Airports in the New York region as well as Washington Reagan and Los Angeles are also constrained for runway capacity, unlike other international hubs in Denver, Chicago, and Atlanta. De-hubbed or de-emphasized airports. From 2006 to 2016 as airlines reduced flights at former hubs such as Cleveland, Pittsburgh, and Cincinnati, they all went from having flights per regional GDP above the national median, to significantly below it. Other cities that were not necessarily hubs experienced a loss in service as airlines de-emphasized traffic at those locations, including Philadelphia, Kansas City, Indianapolis, and Buffalo. Loss to nearby major hubs. Regions that include San Jose, Ontario, Milwaukee, and Hartford experienced declines in traffic as airlines consolidated service at larger airports nearby. Sources: Bureau of Economic Analysis, “Regional Economic Accounts”, U.S. Department of Commerce, 2017 and Bureau of Transportation Statistics, “Airport Snapshot”, U.S. Department of Transportation, 2017. • Over the last 15 years, large hubs fared well. Of all the large hubs, only Tampa and Chicago Midway experienced an increase in average fare and Washington Dulles was the only large hub to see a significant decline in domestic passengers. • Meanwhile, nearly half of medium hubs experienced fare increases since 2001. While it used to be less expensive to fly out of an average medium hub airport, now the average fare for medium and large hubs are equal. • Airports where traffic grew the most are in regions with robust economies such as San Francisco, Charlotte, and Seattle. Meanwhile airports that were former airline hubs like Cincinnati and Memphis saw dramatic declines in traffic. • The relationship between the number of domestic flights to the health of each region reveals several different typologies of airports. Some large hubs and international gateways have strong ratios of traffic to GDP as do several popular tourist destinations. Other airports that lost their hub airline fell from having more flights per GDP than the national median in 2006 to significantly below it, except for Memphis, which fell but still has more flights than the median. • More research is needed to understand the trends that affect air service in individual metropolitan areas. Since 2005, the airline industry has consolidated, the price of fuel has varied dramatically, the U.S. economy suffered and mostly recovered from the Great Recession, regional air lines have dealt with a chronic pilot shortages, and federal rules have changed. Any combination of these factors can affect the levels of service in specific markets. Eno Center for Transportation, “What effect does airline consolidation have on passengers?” Eno Aviation Insights No. 4: November 2017. Ben Mutzabaugh, “Delta to Pull Plug on Memphis Hub after Labor Day,” USA Today, June 4, 2013; and Fangwu Wei and Tony Grubesic, “The Dehubbing Cincinnati/ Northern Kentucky International Airport (CVG): A Spatiotemporal Panorama,” Journal of Transport Geography, Vol 49. 85-98. Susan Glaser, “Cleveland Hopkins Rebounds from United Cuts, Sees Passenger Increase in 2015,” Cleveland Plain Dealer February 29, 2016. Some of this is driven by the growth in so-called Ultra Low Cost Carriers. See: Alexander R. Bachwich, “Airline Business Models 2006-2015: Trends and Key Impacts,” Massachusetts Institute of Technology, 2017. Together, large and medium hubs carry around 88 percent of U.S. passengers each year. For a list of airports in each category see: Federal Aviation Administration, “Airport Categories”, 2017. 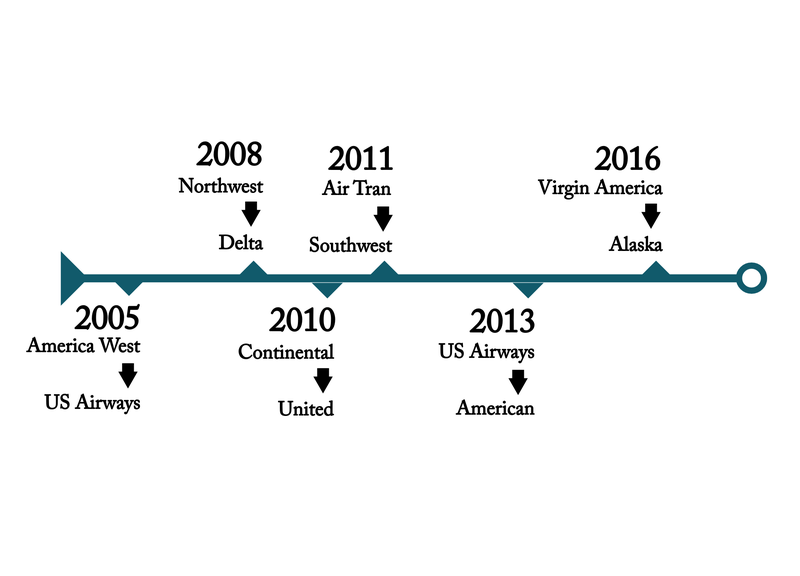 This research uses 2005 as a starting point because that was when the first of several major airliner mergers occurred. See Eno Aviation Insights No. 4, “What effect does airline consolidation have on passengers,” November 1, 2017. FAA/OST Task Force, “Airport Business Practices and Their Impact on Airline Competition,” U.S. Department of Transportation, 1999. The section does not explore changes in GDP and population in these cities, it purely looks at the aviation markets. Jessica Dyer, “Southwest Cutting 6 Flights for Albuquerque”, ABQ Journal, May 19, 2014. John Heimlich, “Status of Air Travel in the USA,” Airlines for America, April 2016. Bureau of Transportation Statistics, “Airport Snapshot”, U.S. Department of Transportation, 2017. Eno Center for Transportation, “Addressing Future Capacity Needs in the U.S. Aviation System, November 2013. How are airlines making money? 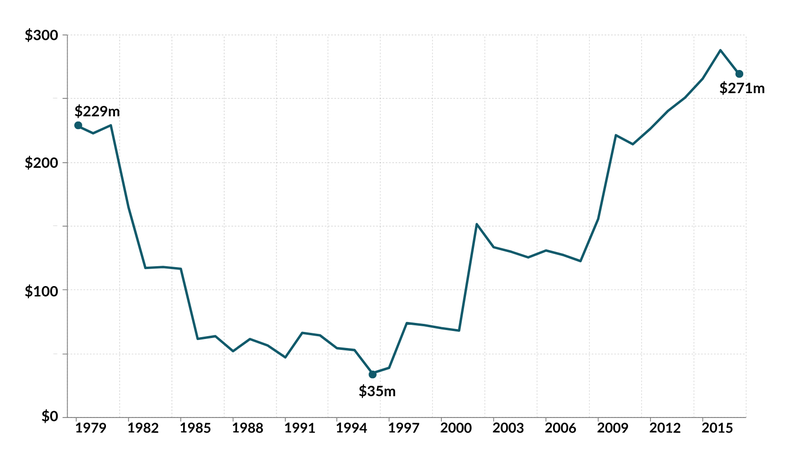 Airlines in the United States are experiencing their most profitable years since deregulation. 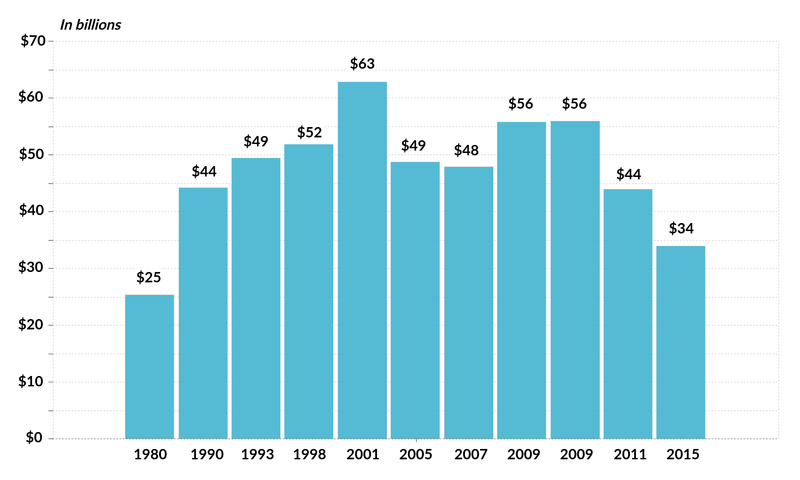 However, average ticket prices are much lower than they were in the 1980s and early 1990s. So what is responsible for airlines’ financial success? 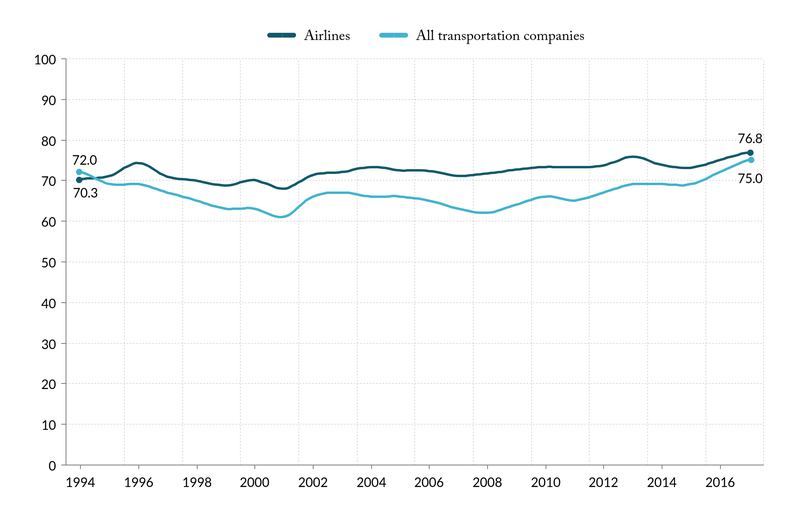 Profit margins for airlines vary considerably since air traffic is dependent on economic cycles. Naturally, both business and leisure travelers fly less during recessions and economic slowdowns. For airlines, this means cycles of boom and bust, sometimes accompanied by bankruptcies and consolidations. Figure 1 shows a comparison of airline profits to the “average net margin” of other large companies in the United States. Airlines underperformed almost every year until 2013 when net income rose sharply, and much higher than the U.S. average net margin. Source: Airlines for America, “Profitability Trend of U.S. Passenger Airlines in the Deregulated Era”, 2017 and National Bureau of Economic Research, “U.S. Business Cycle Expansions and Contractions”, 2017. Net income is in billions of constant 2016 dol-lars and includes all income deducted of all expenses. 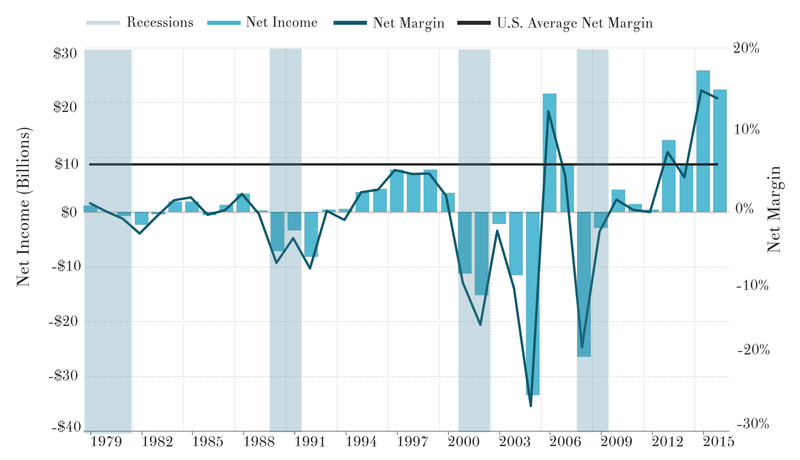 Net margin is the ratio of the net income over all the revenues. The profitability after 2012 followed a spate of mergers among major carriers. Continental, US Airways, Northwest, TWA, America West, and Air-Tran all folded into other airlines. This left American, Delta, Southwest, and United with nearly all of the domestic market. Consolidation allowed airlines to shed unprofitable flights, withdraw from smaller markets, and reduce the amount of major operational hubs in the U.S. Eno Aviation Insights will explore the effects of the mergers on individual markets and consumers in a later brief. Beyond consolidation, airlines have been able to turn profits in recent years not by increasing average fares but in large part by increasing the occupancy, or “load factor,” of each aircraft as illustrated in Figure 2. 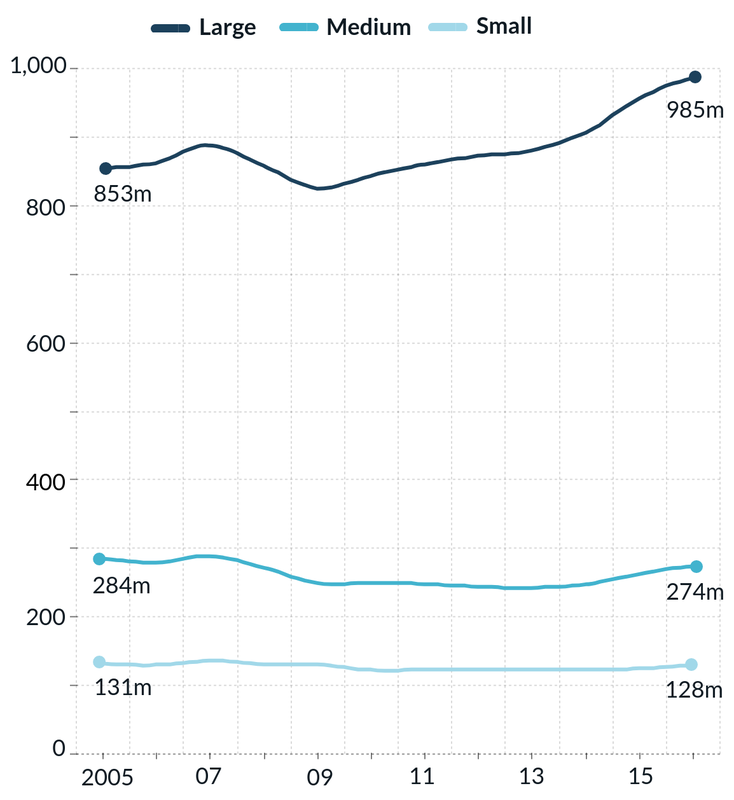 Higher occupancies on aircraft has helped to accommodate the increased number of flyers while decreasing the number of flights, particularly for small and medium-sized hubs where the total number of scheduled departures dropped by 28 percent since 2005 (Figure 3). Fuller flights, however, can cause headaches for travelers and airlines, as disruptions in travel such as cancellations and missed connections take longer to find a seat on another flight. Source: Bureau of Transportation Statistics, “Load Factor”, U.S. Department of Transportation, 2017. Not only are load factors higher on planes today, but as seats have gotten smaller there are also more passengers in the same size aircraft. Every eight rows of seats that are reduced by four inches means adding a new row of passengers. Source: Bureau of Transportation Statistics, “Airport Snapshot”, U.S. Department of Transportation. Of course, investors and shareholders benefit greatly from a profitable airline sector. Stock prices for the largest airlines neared all-time highs this summer. At the same time, the average age for mainline and regional aircraft is increasing (Figure 4). It is conceivable that growing profits and margins are enabling airlines to invest more in customer product and services. Fleet renewal programs are underway at major U.S. airlines while several low-cost competitors continue to grow using new aircraft. In 2015 and 2016, capital expenditures by U.S. airlines surpassed $17 billion, a level unseen since 2001. This includes new planes, Wi-Fi equipment on aircraft, and investments at airports from check-in kiosks and baggage delivery systems, to entire terminal facilities like JetBlue’s $200 million investment at New York’s JFK airport. Source: Bureau of Transportation Statistics, “U.S. DOT Schedule B-43 – Aircraft Inventory”, U.S. Department of Transportation, 2017 and Airlines for America, “A4A Presentation: Industry Review and Outlook”, 2017.
consolidation and from accommodating more passengers on fewer flights. fleet renewal that should directly benefit consumers. See e.g., Benjamin Zhang, “Warren Buffett’s $10 billion Airline Investment Reveals Everything You Need to Know About the Industry,” Business Insider, February 19, 2017. Eno Center for Transportation, “Jet Fuel Prices Have Dropped Significantly. Why Haven’t Ticket Prices?” Eno Aviation Insights No. 2: October 2017. Aswath Damodaran, “Margins by Sector (US)”, Damodaran Online, New York University, 2017. Eno Center for Transportation, Eno Aviation Insights No. 4, forthcoming. Claire Groden, “These cities have lost the most flights,” Fortune, July 23, 2015. While a 100-seat aircraft in 1995 had 67 occupied seats on average, in 2016 that value had risen to 85. Stephanie Rosenbloom, “Fighting the Incredible Shrinking Airline Seat,” New York Times, February 29, 2016. Nasdaq, “Airline Stock Roundup,” August 23, 2017; and Nasdaq, “Airline Stocks Regain Strength as Irma Loses Intensity,” September 12, 2017. Benjamin Zhang, “Airlines are Trying to Make Flying Less Terrible—Here’s How,” Business Insider, August 7, 2017. Heather Muse, “Can JetBlue Make Customs Less Painful? It Hopes So”, Fortune.com, November 12, 2014. One of the areas were airlines have been investing in is onboard Wi-Fi. Since Wi-Fi was first offered onboard an American Airlines flight in 2008, U.S. airlines have installed the technology in hundreds of aircraft. Now, the biggest carriers offer the service in the majority of their airplanes, with the three “ultra-low cost” carriers (Allegiant, Frontier, and Spirit) being the exception. Virgin America was the first airline to have Wi-Fi available in its fleet (in 2009). Now Delta, JetBlue, and United also do and Southwest is planning to do the same in 2017 after older aircraft are retired. Question 1: Is Air Travel Becoming Pricier for Travelers? Question 2: Jet fuel prices have dropped significantly. Why haven’t ticket prices? Service contracting is a tool that government can use to improve transit service quality for riders and better position transit agencies to succeed in today’s dynamic transportation industry. Public agencies must strongly align the private sector’s profit motive with the public sector’s goals in order to unlock this potential using financial incentives in contracts and market competition during the bidding process. Public officials and transit agencies who identify this opportunity and use it to advance their long-term goals will have a powerful strategy at their disposal to improve transit for the communities who rely on it. Contracting does not inherently yield better or worse transit service, and contracting is not “privatization.” A litany of government managed and government-funded services are delivered by private-sector contractors working for the government, according to contracts that the government has written to hold private companies accountable for delivering those services. Clear accountability and public oversight, effective management, and carefully designed incentives differentiate the most successful contracting regimes from their less successful counterparts. It is essential that public-sector leaders pursue contracting strategically as a means to further the public interest, without assuming that contracting automatically leads to better service quality or lower cost. Cities and countries where transit contracting is most effective tend to have strong labor protections in place that ensure wages, benefits, and employment are preserved through changes in the contracted operator. Poorly written or otherwise ill-conceived contracts can lock public agencies into bad contracts that erode the status quo and miss opportunities for improvements. Contracting implementation presents an opportunity not only to improve quality of service, but to rethink the fundamental responsibilities of the transit agency itself. Agency leaders are hungry for new ways to respond to changing demographics, emerging technologies, and unpredictable political dynamics. Contracting can help strengthen the industry’s footing when used strategically to address these issues and create structural changes. Contracting is best supported by management structures that are different from the US transit industry’s typical, vertically integrated, government-operated model. Changing the traditional operating model is challenging, but several of this report’s cases show that strong political leadership, good management, and a commitment to improved transit service quality—not a focus on cost-cutting—can lead to progress. In this report, TransitCenter and the Eno Center for Transportation present six case studies—three in Europe (London, Stockholm, and Oslo) and three in North America (New Orleans, Vancouver, and Los Angeles). The research team interviewed more than 70 expert stakeholders from these cities’ transit agencies, city and regional governments, private contractors, researchers, advocates, and labor unions in order to tell these stories. The first lesson is that government cannot contract out the public interest. Government is uniquely positioned to prioritize high-quality, affordable, equitable, sustainable, and safe transit access to its citizens. While transit is publicly subsidized around the world to meet these goals, private companies must strive for profitability—a fundamentally different operating model. Labor protections in place at the national level provide foundational ground rules for contracting in all three European case studies. Cases in New Orleans and Los Angeles show that successful contracting requires a clear vision and articulation of the public sector’s goals as well as the agency expertise required to manage large, complex contracts. Finally, particularly savvy local government leaders can leverage contracting as a strategic opportunity to facilitate more transformational governance change, as agencies in Oslo, Stockholm, and London did. Contracting should be designed to expand, rather than constrain, government’s ability to advance the public interest. The second lesson is that clear contracts can align contractors’ profit motive with agency goals. Public agencies that contract must clearly articulate their goals and set specific performance standards for private contractors to meet when those contractors seek to profit from public investments. 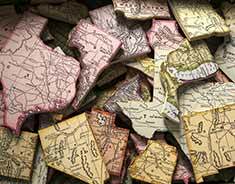 Cases in London, New Orleans, and Los Angeles demonstrate the importance of learning from peer agencies and refining contracts over multiple iterations. London’s use of excess wait time to evaluate bus route reliability and Los Angeles’ use of Vision Zero–related contract incentives are examples of aligning agency goals with strong and measurable performance metrics. Vancouver’s Canada Line contract shows the importance of preserving operational flexibility within the contract itself. Each case study also reflects various context-specific approaches to defining contract-term length, asset ownership structures, and the overall structure of the contracting relationship. The third lesson is that symbiotic agency-contractor relationships can improve operations and foster innovation. While strong public oversight is a precondition for successful contracting, contractors should also be cultivated as allies in serving the public interest. Agencies in Oslo and Los Angeles show the value of engaging contractors on strategic issues, not just operations, especially because contractors can bring valuable knowledge from the other cities in which they work. The Stockholm case provides an example of an agency setting clear expectations around how the agency will assess financial bonuses and penalties, which is part of fostering a mutually respectful, professional relationship. Stockholm also presents one of the clearest cases of staffing changes intended to complement contractor skills—staffing changes that can enable agencies to focus more on policy and planning to benefit their riders while contractors serve as the agency’s “eyes and ears” in daily operations. This report presents key operational and strategic insights throughout the six case studies and summarizes those insights in a checklist of concrete actions that city and regional government leaders should take when contracting for private service operations. Contracting out effectively is hard work requiring specialized skills, but transit agencies that internalize and heed this report’s recommendations will gain powerful management strategies—and transit riders will be the key beneficiaries. A Bid for Better Transit was co-authored by the Eno Center for Transportation and TransitCenter. It was written by Stephanie Lotshaw, Paul Lewis, David Bragdon, and Zak Accuardi. TransitCenter is a foundation that works to improve urban mobility. We believe that fresh thinking can change the transportation landscape and improve the overall livability of cities. We commission and conduct research, convene events, and produce publications that inform and improve public transit and urban transportation. For more information, please visit www.transitcenter.org.